The protocol for Imperial Oil megaloads on U.S. Highway 95 changed this week as the shipments received the green light from the Idaho Transportation Department to resume travel. ITD temporarily suspended permission for the loads to travel after an accident Dec. 6 south of Moscow on Highway 95. Three rigs, including the one involved in the accident, would have been allowed to go Thursday, but they were postponed to an undetermined date because of weather. The plan you see here was released today by the Idaho Transportation Department. It outlines what steps will be taken to prevent a repeat of last week’s non-inury collision on U.S. Highway 95 involving a megaload. The story I’m writing for Friday’s paper will have even more information about how ITD, Imperial Oil, and Mammoet, the oil company’s hired hauler, are handling the accident. The driver of a mini-van pulled over by a flagger and hit by the lead megaload at a staging area south of Moscow, Idaho, on November 8 told a local radio station manager/reporter that he sustained minor injuries that have resulted in back and leg pain from the collision characterized by Idaho State Police as a non-injury accident. Although he refused a recorded interview, James Urquidez expressed dismay with his near-fatal experience, the dismissive attitude of megaload facilitators and accident investigators, the Idaho state police, and megaload hauler Mammoet’s delayed compensation for his unusable, totaled vehicle. Listen to Driver Reports Minor Injuries after Being Hit by Megaload Last Week, between 15:12 and 12:29 on the KRFP Radio Free Moscow Tuesday, December 13, Evening Report, Driver Hit by Megaload Injured. 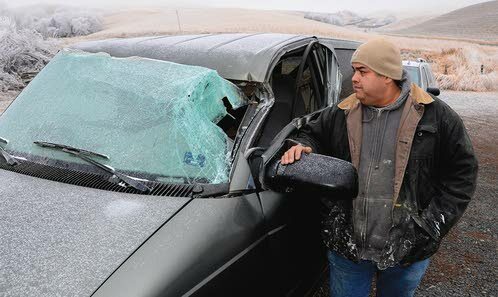 James Urquidez looks over the damage to his van after being involved in an accident with a large load near Moscow (The Lewiston Tribune/Steve Hanks photo). MOSCOW – James Urquidez obeyed his first instinct when he realized a megaload was coming right for his head: duck. “When I realized he wasn’t going to make it, it was too late to do anything else,” Urquidez said Monday. The Idaho Transportation Department suspended the mega load shipments from the Port of Lewiston. LEWISTON, ID – The Idaho Transportation Department suspended the mega load shipments from the Port of Lewiston. The move comes after a collision involving one of the Imperial Oil refinery modules. The Moscow-Pullman Daily News reports the suspension includes three shipments that were scheduled to travel on Wednesday. Idaho State Police said Tuesday’s collision involved one of three shipments that left the port Tuesday night. ISP said they were supposed to stop at a staging area near Moscow, but one driver tried to leave before southbound traffic was released. Police said the module struck a van, causing severe damage, and pushed it into another vehicle. An Imperial Oil spokesman said the company will keep its shipments suspended until it’s confident something like that won’t happen again. The modules are bound for Canada. MOSCOW, Idaho – The Idaho Transportation Department is suspending shipments of Imperial Oil refinery equipment from the Port of Lewiston after a collision involving one of the equipment modules. The suspension includes three shipments that were scheduled to travel Wednesday, department spokesman Adam Rush said in an emailed statement. Idaho State Police Capt. Lonnie Richardson said Tuesday’s collision involved one of three shipments that left the port Tuesday night. The shipments were supposed to stop at a staging area on U.S. Highway 95 before traveling through Moscow in a convoy, but one driver tried to leave before southbound traffic was released, Richardson told the Moscow-Pullman Daily News. The module hit a van, causing severe damage and pushing that van into another vehicle. No one was injured, Richardson said. The Idaho Transportation Department has suspended the ongoing Imperial Oil/ExxonMobil megaload shipments after a crash south of Moscow on U.S. Highway 95, the Moscow-Pullman Daily News reports. One of the giant loads of oilfield equipment bound for the Alberta oil sands crashed into a van, causing severe damage and pushing the van into another vehicle; however, no injuries were reported. “This was clearly driver error,” Idaho State Police Capt. Lonnie Richardson told the Daily News. Imperial Oil spokesman Pius Rolheiser told the Moscow newspaper the company “won’t move until we’re confident this won’t happen again.” Click below for a full report from the Associated Press and the Daily News. A mega-load driver is to blame for an accident Tuesday night that damaged two vehicles. LEWISTON, ID – Idaho State Police say just before 9:45 a Mammoet driver destined for Canada got confused in the staging area south of Moscow on U.S. 95. Instead of stopping, he continued through the area and hit a van that was stopped for the staging. The van was pushed into the vehicle behind it. No one was injured. ISP said the accident was caused only by driver error. It’s not yet been decided if the driver will be charged. The other two loads in the same convoy continued north. The Idaho Transportation Department has suspended further shipments of Imperial Oil refinery modules from the Port of Lewiston following a Tuesday night accident south of Moscow. MOSCOW – After a noninjury accident on U.S. Highway 95 about one mile south of here, megaload movements through Moscow have been suspended.